I’ve mentioned previously how hard it is for me to get into the Christmas groove ever since we’ve moved to Australia. This year feels slightly better for me although with our move (only house not continent) just ahead of us there are many other things on my mind. I think it’s thanks to making Christmas cookies and seeing the tree looking better and better. 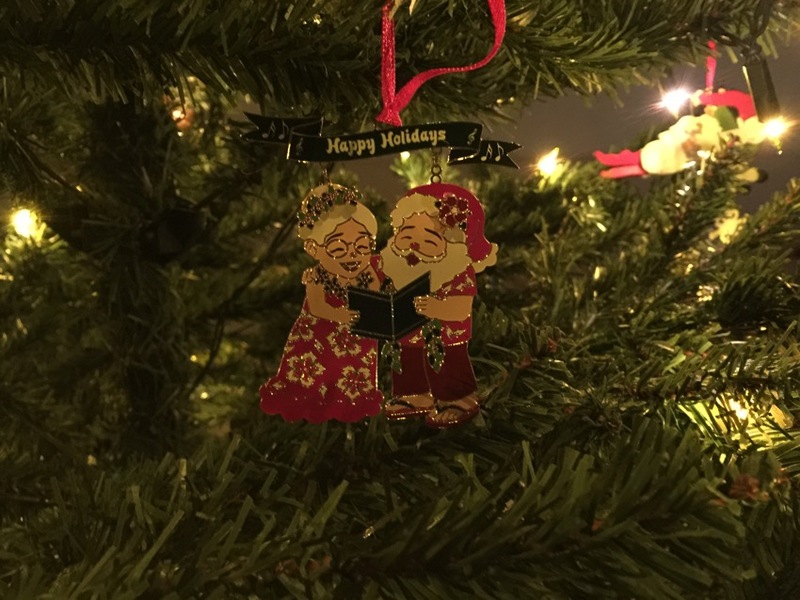 Now I decided to create a little Blog Challenge and you can all help me and my husband getting into the Christmas groove. I’ll get to the rules in a sec. Have I mentioned our tradition? I think I did. For those of you who have missed it: We usually put up our tree end of November and from then onward the kids put one ornament each up every day. I agree, the tree looks pretty weird in the beginning but it’s nice to see how it slowly changes and sparkles more and more. And the excitement of the kids is just fantastic. It’s hard for them to brace themselves and not put up more than just one ornament. I think you know what I mean. Hugh, as much as I’d like to participate in your amazing photo challenge this week, I simply can’t. There’s nothing on the top of our tree just yet. It will be put up on the 23rd. But if you don’t mind I’m cheating slightly and post a pic of one of my favorite ornaments. Not sure who put it up but it’s finally up. If you have your tree already decorated fully how about you head over to Hugh’s Photo Challenge and participate? It’s a fun challenge. So here is my picture, which I also would like to make a part of Colleen’s fun Christmas Tree Around The World feature. And now I have a little favor to ask from all of you: As I said, our Christmas groove is slower than it used to be back in Switzerland. Mainly because there are not a lot of decorations around us. People just don’t seem to decorate their houses as much as they do back in the motherland. But it’s also the council that doesn’t make an equal effort. So back to my Blog Challenge. Let’s call it Momma’s Christmas Decoration Challenge. I will reblog your post in return and will decide on a winner of this challenge by letting my readers vote in the last week of December. Did I forget anything? Oh yes! Please feel free to share this with your readers. I’d love to see as many pics as possible! This entry was tagged Australia, Blog Challenge, Christmas Tree Around The World, Expat, Hugh's Photo Challenge, Photography, Switzerland. Bookmark the permalink. Hi, Sandra! That is a wonderful idea! Due to a lack of time, I hope this helps too: https://erikakind.wordpress.com/2015/12/10/finally-our-christmas-lights-within-the-snow-2/ Merry Christmas! For sure! Showed it to hubby already and we both loved it! I love how you put the tree up at the end of November and get the kids to put one decoration a day onto it. What a great idea. I think I’ll adopt that idea next year and take pictures of the transformation. Thank you so much for linking this back to my challenge. My challenge is open until 5th January, so if you do get a chance to snap a picture of the tree topper then please do show it off to all of us. In the meantime, I love that decoration you have shown off to us and it and your post have certainly helped us get nearer that charity donation target. Thank you so much. Absolutely, love your tradition.. Isnt that how life is.. We start with nothing and towards the end, it looks like we have built each and every moment day by day.. Decorated youth and glorious past fills our memories. I am not there yet but that’s how I plan to spend my old age- by looking back at the days I have lived (and probably to the fullest).. Beautifully said! How are you doing? And a lot of positive energy right back to you! hi Momma 🙂 I wrote this for another prompt, but I thought it will also go with your challenge. Have a lovely day! Thank you so much! I will schedule to reblog for tomorrow. Hahahaha… That would be great! Go for it! I need a grown-up looking tree, like yours. So beautiful! Every year I say that I’m going to go buy new and better ornaments and then never get around to it. This year – this year I will stock up. As for the picture challenge, I do hope that many people participate and that you get a lot of wonderful photos. Unfortunately around here, it seems as though very few people decorate anymore. It’s sad. Christmas just doesn’t seem the same anymore. BUT, if I do see something nice I’ll be sure to write about it. I love your tradition. It’s so sweet, and teaches the virtue of patience. I’m hoping to take a tour of the Christmas lights in my area, this Sunday, and I’ll be sure to join in if I get any good shots. It is! I really enjoy it. And the kids love it because they did it. So less stressful and more meaningful than rushing to get it done. I don’t have a camera. I like what your putting in the comments!!! Keep it up! I love the tradition of putting up one christmas ornament per day!! So cute!! Well, I am old and slothful on the holiday traditions again this year. If I ever get round to completing a post I started over a year ago on our holiday traditions, you will have a better idea why. Suffice to say that this year we had the family together for only 3 days so Spouse and I basically decided that it was not worth the time and effort required to put up and take down the tree to enjoy for just that short period. As empty nesters with widely scattered family the gifts would have had at most a few hours to linger under the tree anyway. The kids, I think, counted themselves lucky that I even filled their stockings which I had to present them the day before Xmas eve. One of them had to leave for a long drive and overnight Xmas eve stay before catching their plane back home on Xmas day.